What makes a campus resonate with students is the ability to create shared, meaningful experiences within their learning environment. Integrating creative alternatives into gathering spaces allows students to collaborate on a different level. There has been an increased focus on creating more collaboration spaces recently, but we’re forgetting that independent study is still important. Creating hubs for independent study and innovative spaces for collaboration are equally important. Whether you’re designing one small space, or an entire masterplan, understanding the branding of the educational facility, and the atmosphere the students prefer will help you maintain consistency throughout your design and a cohesion across campus. A makerspace is a space that offers free technology or tools that can be used collaboratively to help hone a skill, practice a craft, work on a project, etc. Educational institutions have been creating sudo-makerspaces with computer labs for years; but consider creating a space with 3D-Printers, computers and laptops, or a non-tech makerspace center like a craft studio that offers painting, sculpting and knitting supplies to learn a new skill. Students are seeking the comforts of home in their pursuit of upper and higher education, and not just in their residential areas. 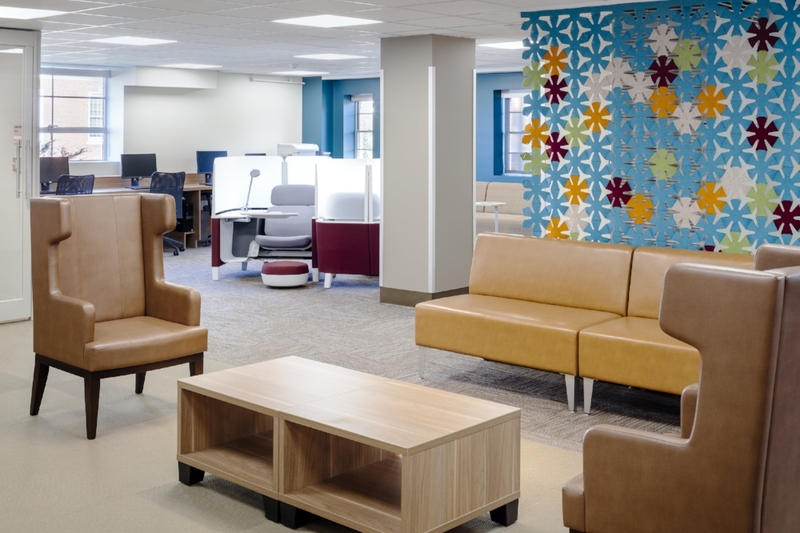 Transforming academic spaces to include a variety of amenities (i.e. lounges, cafes, and other non-traditional study areas) allow students to feel a sense of home while still engrained in academia.